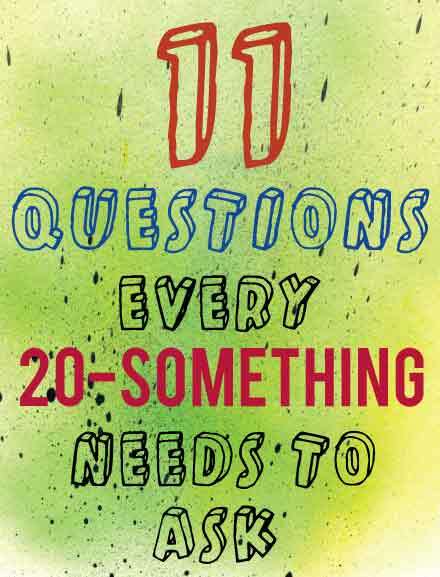 “What now?” is the question that plagues us in our 20s like chickenpox. The more we scratch, the worse it itches. The overwhelming vagueness of “what am I doing with my life?” crushing us like the bully who sat on our head in 3rd grade. 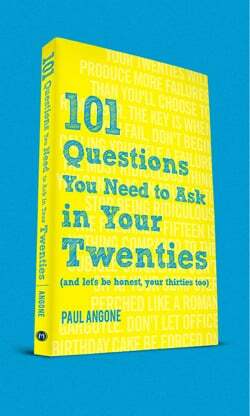 Our twenties can feel like being smothered in questions, but if we don’t ask the RIGHT questions then we’ll forever remain stuck. 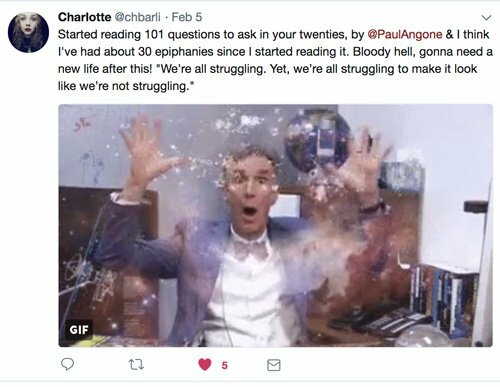 After years of struggle, studying, searching, and being un-glamorously squashed over and over again, here’s what I believe are THE 11 QUESTIONS every twenty-something needs to ask to be successful. 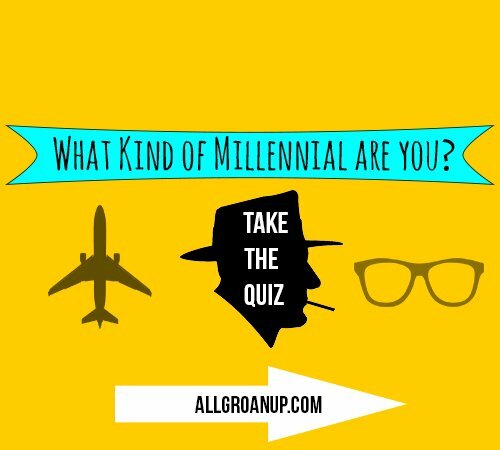 Are your friends taking steps forward or are they still playing beer-pong in the basement? 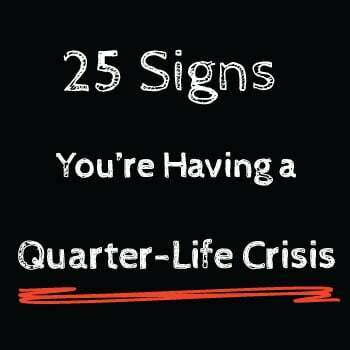 Do you leave hanging out with friends feeling anxious or alive? Are your friends anvils tied around your ankles or jet-packs helping you fly? Your life will resemble the lives of your closest friends — does that fact excite you or freak you out? Think about the one person you most want to emulate? Who is it? Now what is it about their story or character that draws you to them? Write down the words that come to mind. The person you want to be like the most tells you a lot about who you hope to become. What are your top three movies? Is there a common thread that runs through each story? If you want to see what matters most to you, look at the stories that resonate the closest. The common thread that runs through my favorite movies– the underdog who perseveres through pain, thrives from their authentic self, and succeeds at something sane people would never attempt. Your core values are laying on the surface of your favorite stories. Before you start thinking about living with someone else, do you even want to live with yourself? Have you opened up your closet doors and faced your monsters? Too many people go into relationships hoping that it will fix all their problems, when it actually has the magical ability to show you how many problems you really have. Like a third-rate magician, marriage puts big things behind a curtain, but does nothing to make it disappear. If you don’t like living with yourself, is it fair to ask someone else to do the same? What’s the difference? Loving from your insecurities demands from others. Loving from your strengths gives to them. Loving out of your insecurities does not want to see people succeed more than yourself. Loving from your strengths hears of other’ s success and is the first to celebrate with them. Loving from insecurities daily demands “what are you going to do for me?” Loving from your strengths asks others, “what can I do for you?” Too many people love from their insecurities, and that’s not love. We all have talent. And we all have loads of non-talent we keep trying to transform into talent. Write down a few things you’re talented at and a few things you’re not. Then focus on the things you’re good at. Stop trying to chip away at that solid cement block when you have a soft block of cheese just waiting to be devoured. 7. What are my favorite hobbies/things I do for fun, and is there something there I can leverage into a career or product? I heard John Saddington speak, a seriel entrepenur who’s probably best known for creating Standard Theme for WordPress, and he urged us to examine our hobbies. You’ve spent more time doing something than most people have in the world, how can you leverage that experience into something that could make you money? For John Saddington, he loved online computer games, so he started a online dating service for gamers. 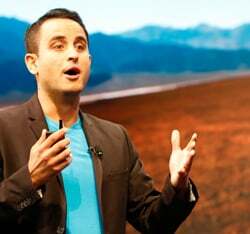 He knew the gaming world and he knew websites, put those two together and he had an over-night success. For me, it’s telling stories. So I started writing them down. 8. What’s the main thing that’s holding me back? Is it an addiction? Anxiety attacks? Depression. An obsession with pinning pictures of rock-hard abs on Pinterest while drinking? What is the main thing that is keeping you from moving forward and who can help you cut the chain? What are you willing to give up and what are you going to cling tight to? Are you willing to move anywhere, but you’ll never take a job that expects more than 40 hours a week? Is job flexibility a non-negotiable or is it job-stability? Write a list of non-negotiables and negotiables, and then do your best to stick to that list. What injustice makes you angrier than a parrot being poked with a stick? And what’s something you can do about it right now? Knowing what breaks your heart can clarify what makes you feel whole. 11. At 29 years and 364 days, if I accomplished just one thing, what do I want it to be? If you only had the choice to accomplish just one thing in your 20’s, what would it be? How do you take one step toward that today? Our twenties can feel like trying to walk with shoes covered in fast-dry cement, so how do we keep moving forward? Is it a phone call to ask for an informational interview? Is it asking a crush out on a date? Is it making an appointment with a counselor? What’s one small thing you can do today, so that you can go even further tomorrow? 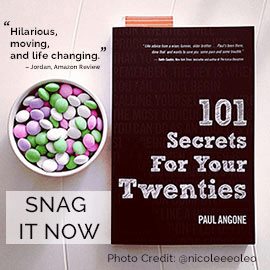 After the success of my best-selling book 101 Secrets for your Twenties, this new book captures the same hilarious, freakishly-accurate assessment of life as a modern-day twentysomething (and thirtysomething), but now we’re digging even deeper. 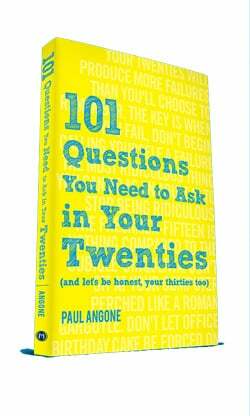 See what readers are saying about 101 Questions You Need to Ask in Your Twenties here.